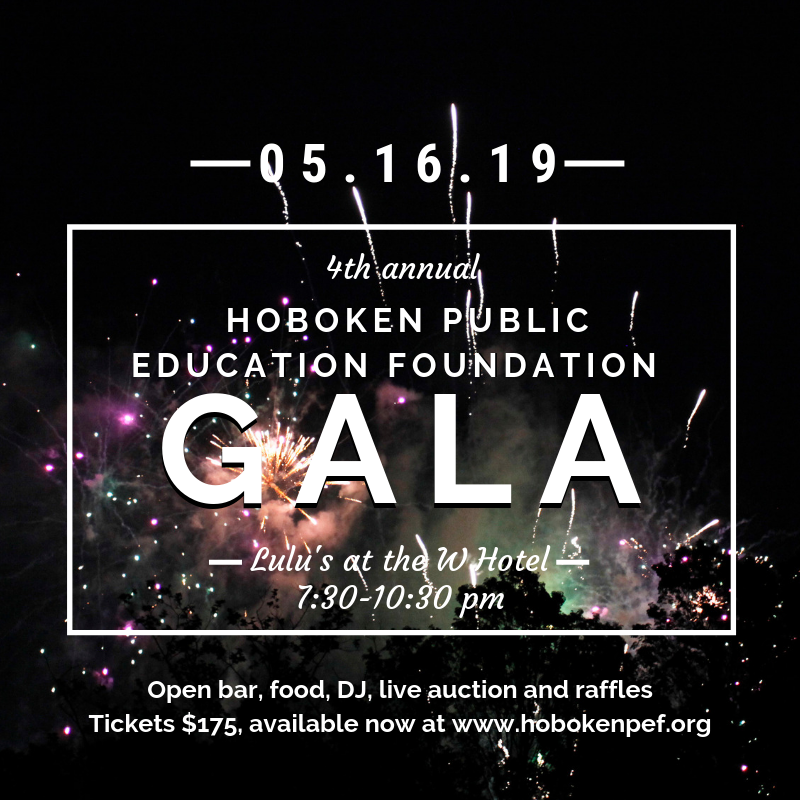 The Hoboken Public Education Foundation (Hoboken PEF) is holding its Fourth Annual Spring Gala at the W Hotel (Lulu’s) on May 16th, 2019 7:30 – 10:30 p.m.
Hoboken PEF is a non-profit 501(c)(3) organization committed to supporting Hoboken Public Schools. The Foundation’s mission is two-fold: 1. to promote the excellent public schools that we have in town and 2. to support them through private funding. We aim to ensure that our district schools continue to be a top choice for families in Hoboken. 100% of the proceeds from this event will be used to fund initiatives and programs specifically for the betterment of the Hoboken Public Schools. Join us for our biggest fundraiser of the year - last year with your support we raised nearly $200,000! Be a part of the excitement, the movement, and the progress. You will not want to miss our Fourth Annual Gala. We will have food, drinks, a DJ, and amazing raffle and auction prices. Last year, this event sold out in ONE DAY so do not wait to get your ticket! With your help, we can achieve even greater heights and elevate Hoboken Public Schools even further. Our young learners are our future, and we can do so much more to support and foster their growth together. Thank you for your support! A large portion of the overhead costs of this event have come from in-kind donations and discounted prices on goods and services, allowing us to maximize our contribution to the Hoboken Public Schools.